Here you can admire handcarved sculptures and art-paintings by craftsmen from Val Gardena and locally produced carvings. Please ask the exhibitors for any further information, price, etc. 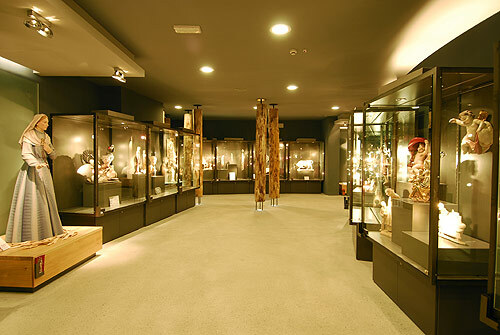 At the ART52 permanent exhibition of the artistic handcraft in Gardena Valley at the Congress Center in Ortisei/ St.Ulrich visitors can admire woodcarvings of our best artists and artisans. In Gardena Valley woodcarving, painting and gilding are crafts with a long famous tradition. The beginning of Gardena's artistic woodcarving dates back to the middle of the 17th century. Since then woodcarving became the most important economic activity in the valley, getting well known all over the world through its unique masterpieces and original products. The permanent exhibition ART52 of Gardenese arts and crafts shows hand carved work of individually working sculptors as well as products of large organized workshops. Completely hand carved sculptures are marked with specially created trade - mark ( a small metal plate ) which is accompanied by a certificate guaranteed by the Chamber of Commerce of Bolzano.